Low volatility and minimum variance strategies have been getting a lot of attention lately due to their outperformance in recent years. Let’s take a look at how we can incorporate this low volatility effect into a monthly rotational strategy with a basket of ETFs. Not the greatest performance stats in the world. There are some things we can do to improve this strategy. I will save that for later. The purpose of this post was an exercise using quantstrat to implement a low volatility ranking system. We can see from the chart that the low volatility strategy does what it is supposed to do… the drawdown is reduced compared to a buy and hold strategy on SPY. This is by no means a conclusive test. 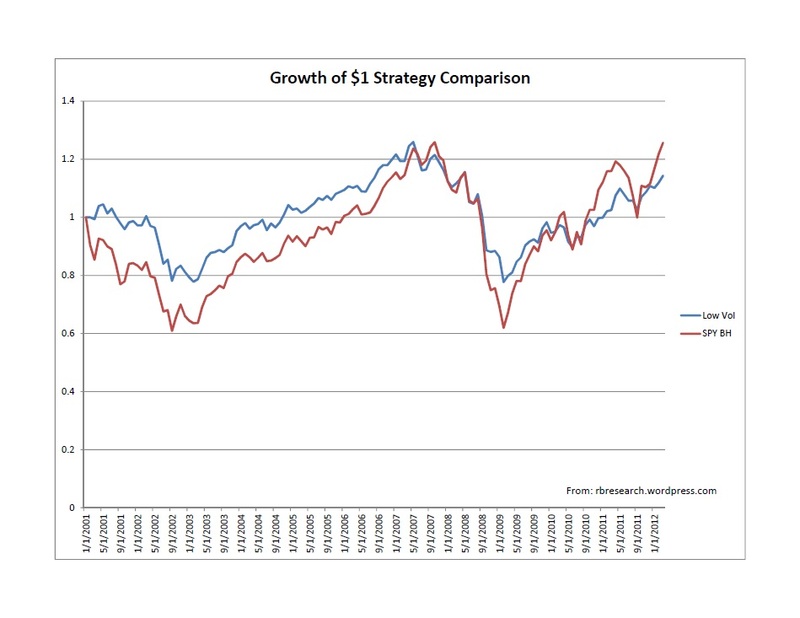 Ideally, the test would cover 20, 40, 60+ years of data to show the “longer” term performance of both strategies. The first step is fire up R and require the quantstrat package. This test will use nine of the Select Sector SPDR ETFs. The measure of volatility that I will use is a rolling 12 period standard deviation of the 1 period ROC. The 1 period ROC is taken on the Adjusted Close prices. My approach for the ranking system is to first apply the standard deviation to the market data and then assign a rank of 1, 2, …9 for the instruments. There may be a more elegant way to do this in R, so if you have an alternative way to implement this I am all ears. Here is what our rank.factors object looks like. Now we need to apply a “RANK” of 1 through 9 (because there are 9 symbols). #Set the symbol's market data back to its original structure so we don't have 2 columns named "RANK"
Now that the market data is “prepared”, we can easily implement the strategy using quantstrat. Note that the signal is when the “RANK” column is less than 3. This means that the strategy buys the 3 instruments with the lowest volatility. See end of post for quantstrat code. Disclaimer: Past results do not guarantee future returns. Information on this website is for informational purposes only and does not offer advice to buy or sell any securities.